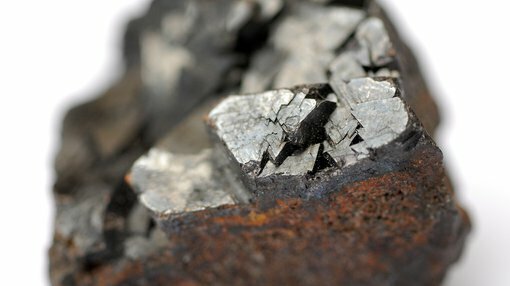 Tando Resources’ (ASX:TNO) first two holes at its SPD Vanadium Project in South Africa have intersected the mineralised unit based on visual identification of magnetite in diamond core and RC chips. This is highly significant because the mineralised unit comprises a series of magnetite layers, which is well established as the host rock for the vanadium mineralisation at SPD. The first diamond drill hole (VDD001) intersected the mineralised unit between 32 metres and 49 metres downhole and the first RC drill hole (VCR001) intersected the mineralised unit from surface. The results are made more significant by the fact that VDD001 is located 150 metres from historical drill hole SPD014, as indicated below. This returned whole rock/pre-concentrate assays of 25 metres at 0.67% vanadium oxide (V2O5), with samples from the same interval generating a magnetic concentrate grading 1.99% V2O5. Of course TNO still has a lot of work to do here, so investors should seek professional financial advice if considering this stock for their portfolio. Hole VDD001 is also located 170 metres from historical hole SFR008, which returned assays of 44 metres at 0.66% V2O5 and generated an outstanding magnetic concentrate grade of 2.26% V2O5 from the same interval as announced on March 22, 2018. 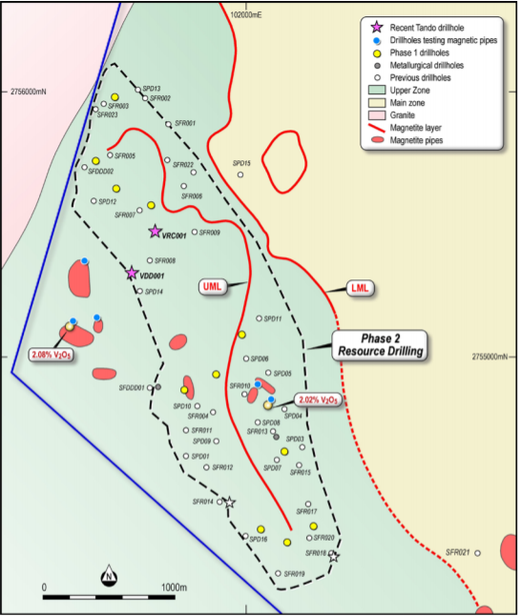 Hole VRC001 is located 150 metres from historical hole SFR007, which returned strong assays of 22 metres at 0.80% V2O5 and a magnetic concentrate grading 2.03% V2O5. Hole VRC001 is also located 150 metres from historical hole SFR009, which returned assays of 23 metres at 0.65% V2O5 and a magnetic concentrate grading 2.20% V2O5. Highlighting the significance of the correlation between the results and previous data, managing director Bill Oliver said, “These initial results are an excellent start in converting the high-grade ‘foreign’ resource at the SPD Vanadium Project to JORC status. Both RC and diamond drilling is ongoing at SPD with the drilling focusing on converting the existing high-grade resource to JORC status, as well as testing the potential of the surrounding high-grade vanadium pipes to support a Direct Shipping Ore (DSO) operation. Phase One of the drilling program will comprise 18 holes for 1650 metres at the SPD deposit, where there is a resource of 513 million tonnes at a grade of 0.78% V2O5 defined under the SAMREC code. This resource is a ‘foreign resource’ as defined in the ASX Listing Rules. Tando expects the JORC-compliant Mineral Resource Estimate (MRE) will be published by the end of October, 2018.